Wart removers are typically topical creams used to eliminate warts from the body. Warts are small and usually painless outgrowths on skin that may be seen on the face, neck, hands and legs, genitalia, and other regions of the body. Wart Remover Poisoning is the accidental or intentional intake (swallowing) of any product containing the compound. What is Wart Remover Poisoning? What are the Causes of Wart Remover Poisoning? What are the Signs and Symptoms of Wart Remover Poisoning? The signs and symptoms of Wart Remover Poisoning can vary from one individual to another. It may be mild in some and severe in others. Several systems of the body may be affected. How is First Aid administered for Wart Remover Poisoning? 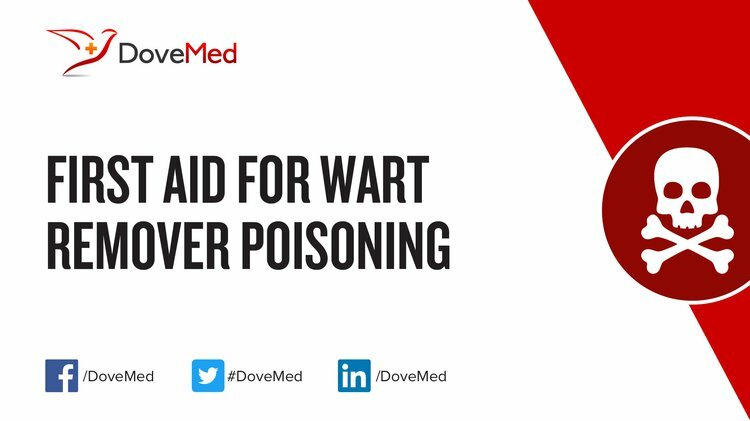 Who should administer First Aid for Wart Remover Poisoning? First aid for Wart Remover Poisoning is administered by healthcare professionals. What is the Prognosis of Wart Remover Poisoning? How can Wart Remover Poisoning be Prevented? Abou-El-Hamd, E. M., Mohamed-Elamir, F. H., & Moustafa, M. F. (2012). Euphorbia helioscopia: chemical constituents and biological activities. International Journal of Phytopharmacology, 3(1), 78-90. Alikhan, F. S., & Maibach, H. (2011). Topical absorption and systemic toxicity. Cutaneous and ocular toxicology, 30(3), 175-186. Kehe, K., Schrettl, V., Thiermann, H., & Steinritz, D. (2013). Modified immunoslotblot assay to detect hemi and sulfur mustard DNA adducts. Chemico-biological interactions, 206(3), 523-528. Pirson, J., Toussaint, P., & Segers, N. (2003). An unusual cause of burn injury: skin exposure to monochloroacetic acid. Journal of Burn Care & Research, 24(6), 407-409. Chyka, P. A., Erdman, A. R., Christianson, G., Wax, P. M., Booze, L. L., Manoguerra, A. S., ... & Scharman, E. J. (2007). Salicylate poisoning: an evidence-based consensus guideline for out-of-hospital management. Clinical toxicology, 45(2), 95-131. Salmonson, H., Taalikka, P., & Hoppu, K. (2000). Ingestion Of Over-the-counter Wart Remover-esophageal Burns Not As Bad As They Look?. Journal of Toxicology-Clinical Toxicology, 38(2), 218-219. Voorde, P. T., Asklund, C., & Venzo, A. (2014). Accidential consumption of wart remover. Ugeskrift for laeger, 176(38). Behrman, A. D., Hawryschuk, L., & Lamkin, S. (2010). A Twist on Aspirin Toxicity: When Symptoms and Levels Do Not Correlate. Journal of Emergency Nursing, 36(3), 282. Shlamovitz, G. Z., Gupta, M., & Diaz, J. A. (2009). A case of acute keratoconjunctivitis from exposure to latex of Euphorbia tirucalli (pencil cactus). The Journal of emergency medicine, 36(3), 239-241. Lev, E., & Amar, Z. (2000). Ethnopharmacological survey of traditional drugs sold in Israel at the end of the 20th century. Journal of Ethnopharmacology, 72(1), 191-205.